Drinking too much, including binge drinking, cost the United States $249 billion. These costs resulted from losses in workplace productivity, health care expenditures, criminal justice costs, and other expenses. Binge drinking was responsible for 77% of these costs, or $191 billion. Binge drinking is the most common, costly, and deadly pattern of excessive alcohol use in the United States. The National Institute on Alcohol Abuse and Alcoholism defines binge drinking as a pattern of drinking that brings a person’s blood alcohol concentration (BAC) to 0.08 grams percent or above. This typically happens when men consume 5 or more drinks or women consume 4 or more drinks in about 2 hours. 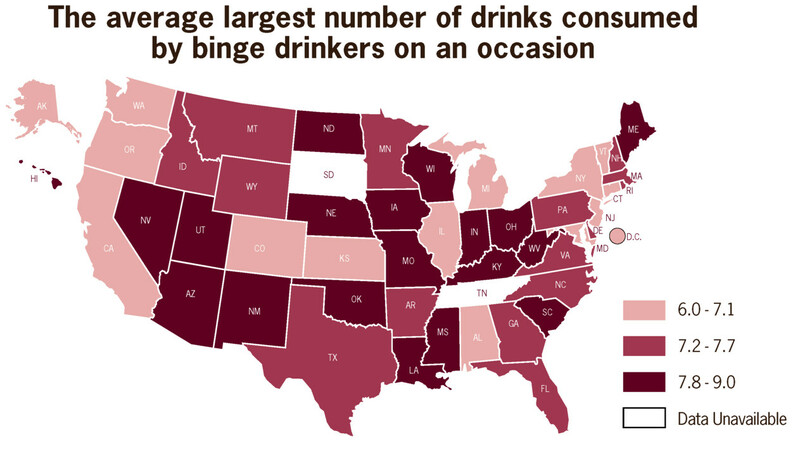 Most people who binge drink are not alcohol dependent. One in six US adults binge drinks about four times a month, consuming about eight drinks per binge. Binge drinking is most common among younger adults aged 18–34 years but is reported across the lifespan. Binge drinking is more common among people with household incomes of $75,000 or more than among people with lower incomes. However, people with lower incomes binge drink more often and consume more drinks when they do. Most people younger than age 21 who drink report binge drinking, usually on multiple occasions. Consult your personal healthcare provider if you feel you or someone you know has a drinking problem. Other resources include the National Drug and Alcohol Treatment Referral Routing Service, available at 1-800-662-HELP. This service can provide you with information about treatment programs in your local community and allow you to speak with someone about alcohol problems. We hope you found this information informative. Please share this article it with others or leave a comment. If you are seeking a safety speaker on the topic of "Safety is 24/7" contact us today.